Crisp and Light Waffles, the aquafaba way! | Eat. Hike. Sit. Exploring food, hiking, and meditation. Crisp and Light Waffles, the aquafaba way! Have you heard about the latest craze in vegan cooking, aquafaba? It’s so simple, yet it’s possible uses are amazing. I’ve been wanting to try it out, but most aquafaba recipes seem to be for meringues and macarons, and I don’t have much of a sweet tooth, so I’ve been waiting to be inspired by a different idea. One day, I will try out a vegan lemon meringue pie, because that sounds incredible. 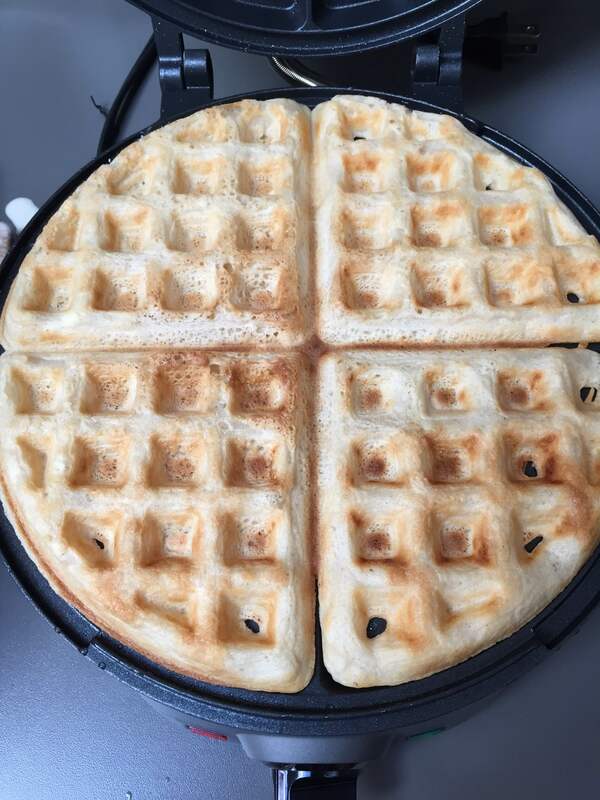 Last weekend, after finally deciding on a new waffle iron to purchase (my old one died a slow death, but lasted me over 15 years! ), I was excited to make my first waffles in several months. And then it came to me – before I was vegan I used to make these light, crispy waffles using whipped egg whites. That must be possible using this magic aquafaba stuff! And I am pleased to report, that my first try at this was a great success. I topped these with homemade raspberry sauce, which is pretty much one of the first things I ever learned to make. This recipe comes from my Home Economics class in Grade 8. It’s so easy and tasty, and would work with pretty much any berry. Mix the flour, baking powder and salt in a medium mixing bowl. In a separate bowl, mix the milk and oil, then add to the flour mixture. 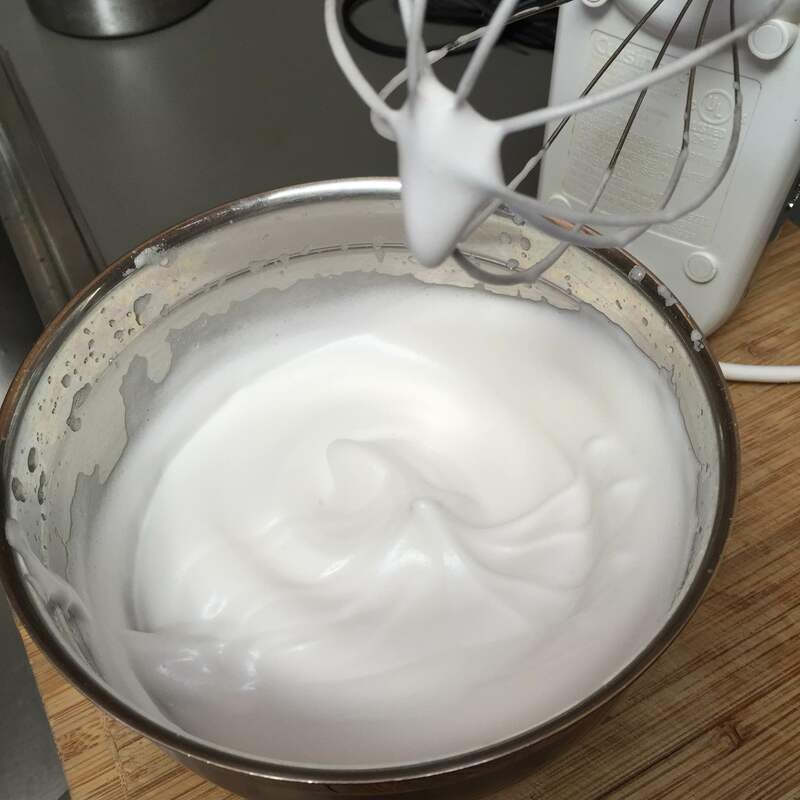 To make the whipped aquafaba, in a separate bowl use a hand mixer and whip for at least 6 minutes. You will know it is ready when you lift the mixer and the peak on the foam stays up. 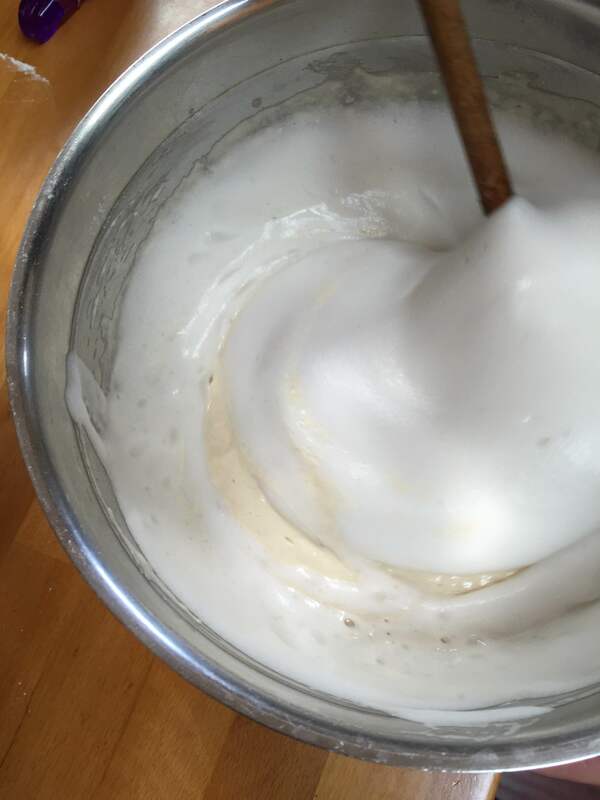 Carefully pour the whipped aquafaba into the waffle batter, and fold it in gently using a wooden spoon. Do not over mix! The foam will decrease in volume significantly once it hits the batter, but you should still see bubbles in the batter mixture. Cook waffles according the directions on your waffle maker. While they are cooking, make the raspberry sauce topping. 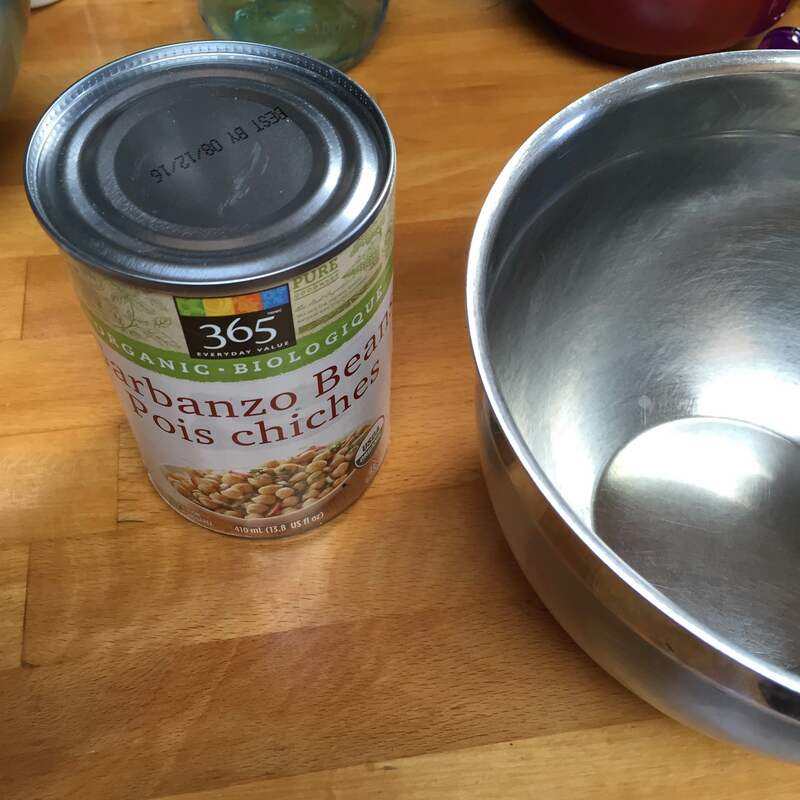 Aquafaba is the liquid from a can of beans, often chickpeas. Drain the liquid and measure 2/3 cup. If you have any extra aquafaba, you can freeze it in ice cube trays. Once you start whipping, it should start foaming up right away. The longer you whip, the stiffer the peaks will be. For this recipe, whip for at least 6 minutes. You will know when it is ready when the peaks stay when you lift the mixer away (turn it off first!!!). 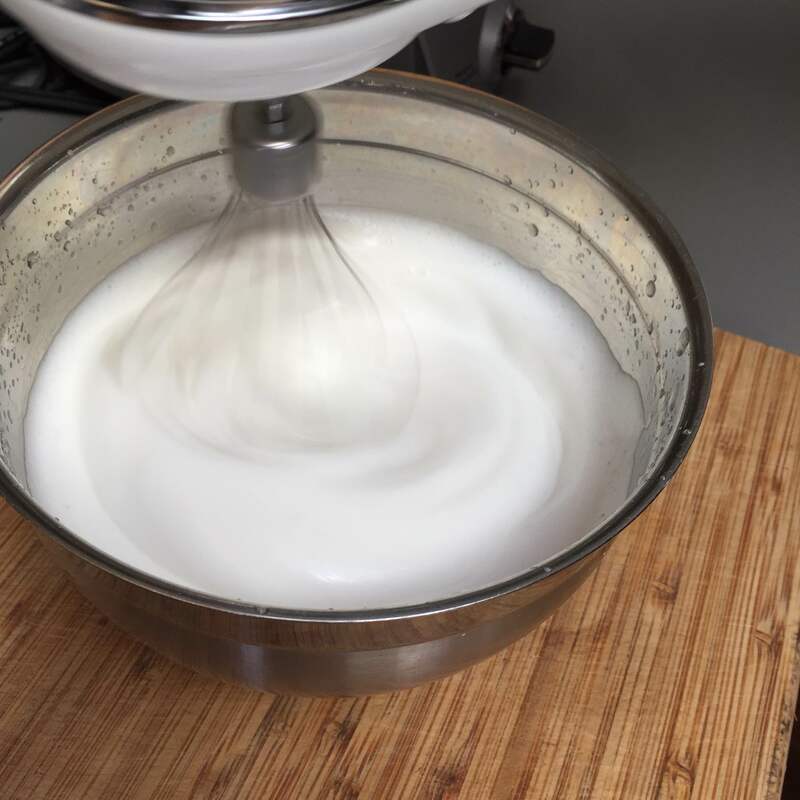 Fold the whipped aquafaba into the waffle batter. Be very gentle! This step should be done with as little mixing as possible. A light, crispy waffle, grilled to perfection! Place all ingredients into a small saucepan. On medium heat, bring mixture to a boil, stirring often. Sauce is ready when the cornstarch turns clear, slightly after boiling. Remove from heat immediately. Glad you enjoyed it, Jaclyn! Was your almond milk at room temp or from the fridge? How about the oil? 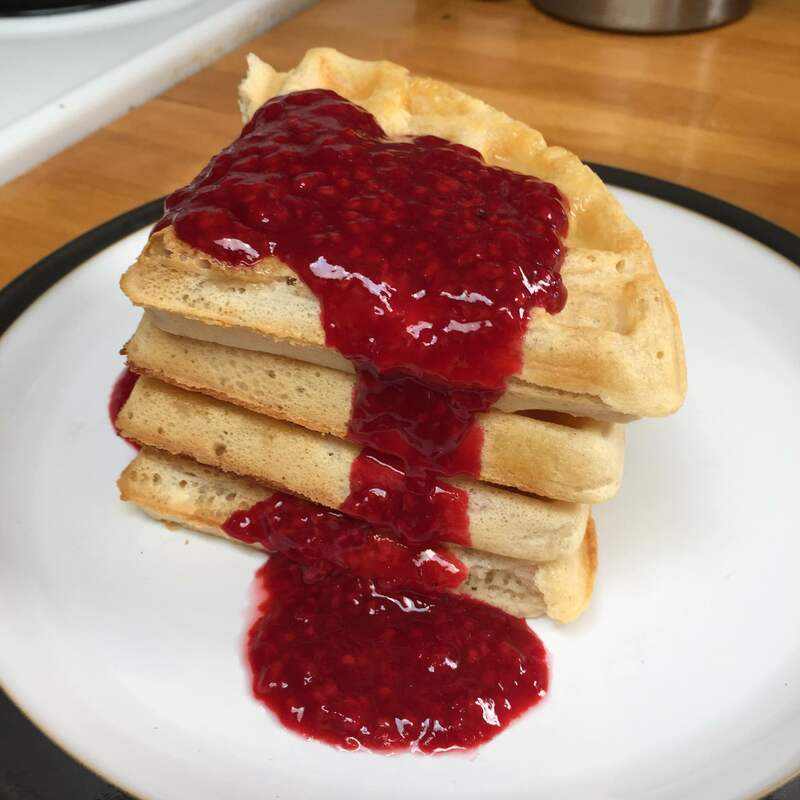 I never have the same results as other people do with waffles or pancakes, and I think it might be because I keep my flour in the freezer, so I would love it if you have any comments. I usually use almond milk straight from the fridge, and I also keep my flour in the fridge, so I don’t think temperature is an issue with either of those. My oil is always room temp and for this recipe I usually melt margarine, so that would actually be warmer. I find that pancakes or waffles that don’t turn out well are usually for one of two reasons: #1 that the batter is over-mixed, which activates the gluten and makes the dough too chewy; #2 that the proper consistency isn’t achieved – either too thin or too thick. The batter should run slowly off of a spoon if you scoop some up. If it runs quickly it is too thin, and if it stays on the spoon it is too thick. Not sure if that is helpful or not, but that is what I tend to go on. My attempt was a complete fail for some reason 😦 I wound up with a bubbly burt mess on my waffle iron. I followed all the steps properly and made sure not to overmix, so I don’t know what went wrong. Sorry to hear that these did not turn out for you! It is hard to say what went wrong, without having seen the batter in person. As I mentioned to another commenter, the most common problem with a batter is consistency. It is difficult to account for all the variables in a recipe: humidity at your location, density of the flour you are using, etc. Therefore, I would say that any recipe for pancakes or waffles will need to be made with a cautious eye to make sure the consistency is right. If it is too thin, add more flour. If it is too thick, add more liquid. In your case, it sounds to me like the batter was too thin. Either that, or the waffle iron was way too hot. Those are just guesses though. I’ve made these myself several times, with great success – and I’ve passed along this recipe to others, who have also really enjoyed it. I’m sorry that in your case they didn’t, but I would suggest trying again with some adjustments. I also had a big mess in the waffle iron. Crisp bits stuck to the iron with a paste in between. But I thought it was worth trying again. This time I heated the iron longer, I also made sure I had enough PAM> not a big fan, but coconut oil spray totally failed. I also let the mix heat in the iron for far longer, maybe 10 min. SUCESS! Brown, crispy, and tasty.I also paid more attention to the consistancy. I kept it pretty thick. These waffles (with minor changes) worked out great for me. I used coconut milk instead of almond or soy. Instead of canned aquafaba, I used homemade. It didn’t get all the way to the stiff peaks phase as described above, which made me a little nervous but it was pretty foamy so I just threw it in and forged ahead. They came out crispy on the outside, soft and light on the inside. Homemade strawberry butter complemented it well. Amazing recipe – turned out great! Really crispy and delicious. Thanks!